AUSTIN, Texas, June 28, 2018 /PRNewswire/ -- Summertime is in full swing, and the peak of the season comes with savings for all. From Independence Day to Amazon Prime Day*, shoppers have plenty of opportunities to cut costs. 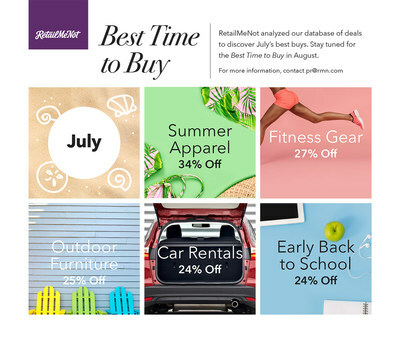 RetailMeNot's shopping and trends expert, Sara Skirboll, advises shoppers to take advantage of major deals this month, especially on Amazon Prime Day, often referred to as Black Friday in July. "Amazon Prime Day is a 30-hour online flash sale event where Amazon offers its Prime Members thousands of deals in tons of categories from TVs to baby wipes. Though the date is still shrouded in secrecy, I suggest shoppers research and take advantage of other retailer offers that will also be released the same day! There's a lot of competition in July for sales and plenty of online and brick and mortar businesses will be offering deep discounts." From fitness gear and outdoor furniture to early back-to-school items and summer apparel, July comes stacked with savings. July is prime time for a weekend getaway or a summer road trip. Whatever the plans, travelers can take advantage of discounts on car rentals this month. Depending on the destination, RetailMeNot data shows that vacationers can save up to 24% on vehicle rentals. Look at retailers like Budget and AVIS to make the next journey easy and breezy. It may seem too early to start thinking about school supplies, but it's never too early to save on things you know you'll need. While the cost of school supplies can really add up, it's the newest technology that does a number on your pocketbook. If your student needs a new laptop or computer, look for low prices during Fourth of July holiday sales and Amazon Prime Day, when deals on several categories of electronics have historically been offered. Even though this is the peak of the summer season, shoppers should keep their eyes peeled for sales on home and garden items, which become more frequent as fall approaches. Patio furniture, in particular, will be a steal this month as retailers start to prepare their sales floors for fall inventory. Shoppers can get outfitted for outdoor fun, from relaxed backyard barbecues to swanky summer soirees, with savings from Macy's, Home Depot and Lowe's. *"Prime Day" is a registered trademark of Amazon. RetailMeNot's use of "Prime Day" is not sponsored or endorsed by Amazon.